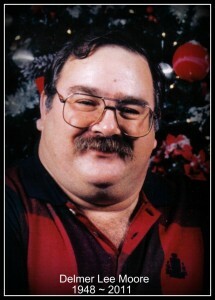 Delmer Lee Moore age 62 passed away Wednesday August 10, 2011 at his home. Delmer was the eldest son of the late Joseph and Susie Preece Moore born November 12, 1948 in Martin County KY. He is preceded in death by his daughter Brooke Lynette Moore. He is survived by his wife of forty years Brenda Webb Moore and son-in-law Christopher and Ashley Hale and Grandson Waylon Ryder Hale. Also surviving are his siblings Eillene Charles) Patrick, Diana (Jerry) Norris, Connie (Joseph) Staton, Denny Ray (Sandy) Moore, all of Inez, And Thomas Mitchell (Brenda)Moore of Frankfort Kentucky. He is also Survived by many Nephews, Nieces and other loved ones. He will be sadly missed by all who knew and loved him. Delmer enjoyed attending Worship services at Freedom Freewill Baptist Church where he was a faithful member. Delmer retired from Martiki Coal as Chief Electrician. He was very Diligent at his job, took great pride in his work and enjoyed his fellow employees and his job. He also worked for Hyster Corporation in Berea Kentucky; H. K. Porter Company in Richmond Kentucky; and Buckeye Steel and Casting in Columbus Ohio. Visiting will be on Thursday August 11, 2011 from 6-9 PM at the Phelps and Son Funeral Home. Services will be conducted by Larry Goble and Denny Ray Moore on Friday August 12, 2011 1PM in the Chapel of the Phelps and Son Funeral Home in Inez with burial to follow at the Golden Shores Memorial Gardens on Coldwater Road in Inez. Pallbears will be Evan Norris, Joseph (Dusty) Stanton, McKinley (Ken) Moore, Sean Moore, Connor Moore and Alex Adams.